Carhub is a comprehensive automotive portal offering a unique, patent-pending, fully integrated technology and multimedia platform that connects all facets of the automotive world. CarHub brings together the best of what the industry has to offer, from compelling automotive research tools to a robust marketplace fueled by a real-time inventory feed of millions of vehicles. With innovations like CarTron, a unique customer interface that helps consumers find the best car for them in mere minutes, and CarHub Connect, our state of the art OBD device and accompanying mobile app, CarHub now makes the total car ownership experience effortless. Never before has an automotive portal covered every aspect of the car buying, selling, and ownership process from start to finish the way CarHub does. CarHub was designed from the ground up by industry experts to be the solution to any car related needs a consumer may have. We not only cover the essentials of buying or selling a car, but also tackle the areas of the industry that are typically neglected by others in the industry. Now CarHub has a way to help. We've worked for over two years with renowned psychologists and data scientists to create a test that finds customers the perfect car to not only match their budget and needs, but also their unique personality traits. According to recent data, nearly 70% of all new car shoppers are undecided about which specific car to purchase, but nearly all of today's existing sites assume that their users already know exactly what they're looking for. Our exclusive patent-pending Al-based personality and needs quiz finds the perfect car for undecided buyers. Accurately provides a percentage match with vehicles that are actually in dealer inventory. 2/3 of all car shoppers are undecided as to brand/model. 3rd party automotive sites start with make and model. Massive conversion opportunity for a market base that is severely under-served. CarTron makes a dealer's job infinitely easier by not only matching undecided car buyers to the right car and dealer, but also making them less intimidated by the search process itself, more focused on what they want, and ultimately more motivated to buy. As a result, now dealers can spend more time showing customers the precise car they're going to respond to enthusiastically and be ready to purchase. In addition, CarTron-guided consumers are often the highly coveted demographic of undecided buyers not necessarily loyal to a brand or dealership - yet. They’re in the market, ready to buy, and most importantly, often incremental buyers. With all that Carhub.com offers, by the time customers get to the point of visiting a dealership, they’ll have gathered all the information they need to make delivery fast and easy. Reduced delivery time equals more time for other customers and more sales for dealers. If the customer intends to finance or lease, CarHub helps prepare any application, and securely transmits it to the dealer. CarHub does not in anyway interfere with or broker the finance application for the purchase of the vehicle. We simply hand it over to dealers to make their lives – and business – easier. If a customer does, CarHub gathers all the relevant details of their vehicle, from its condition to payoff balance, if any, and electronically transmits this information to the dealer. By doing this before the customer shows up in person, CarHub allows dealers to know what car a customer wants, their credit-worthiness, and the value of their trade-in ahead of time, so they can close a deal in mere minutes - versus the 3 to 4 hours that’s currently the standard in the industry. Most dealers complain about how they waste tremendous amounts of time and money sifting through a pool of extremely poor quality leads. CarHub’s mission is simple: To make the car buying and selling process easier, faster, and more enjoyable for all parties involved – and to do it in a way that has no negative impact on a dealership’s business. We give dealers full control over how they want to run their online presence with CarHub and only show vehicles on our site in a way that they prefer. Soon we’ll offer up-front pricing plans that allow dealers to present no-haggle pricing on either all, some, or none of their vehicles. It is entirely their choice. We never dictate the terms of how dealers price their vehicles in inventory on our site and never make DMS access a requirement to work with us. Of the over 260 million cars on the road in the United States currently, only 2-3% of these vehicles are for sale on any given day. This means there are over 250 million car owners who are not buying and selling, but still spending money on various aspects of their car ownership - everything from accessories to maintenance and repairs. 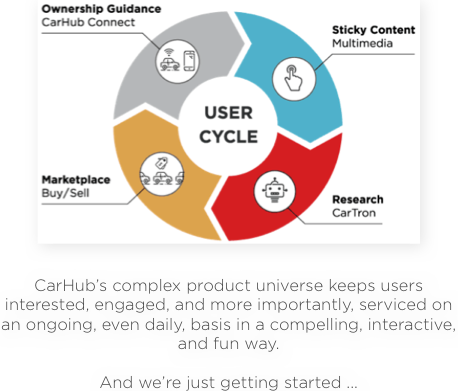 What CarHub does differently than other automotive sites is go beyond just being a buy or sell portal. We engage this vast untapped market of car owners by helping them manage their ongoing car life in a way that has never been done before – through our innovative CarHub Connect OBD device. CarHub Connect is the first OBD II device offered by an automotive portal - and the first of any kind to be offered for FREE. CarHub doesn't charge our customers for the device or the accompanying CarHub smartphone app, and we don't charge any recurring or subscription fees. CarHub Connect fits into any car produced after 1996 and helps consumers manage virtually all parts of their car ownership experience with ease and convenience. 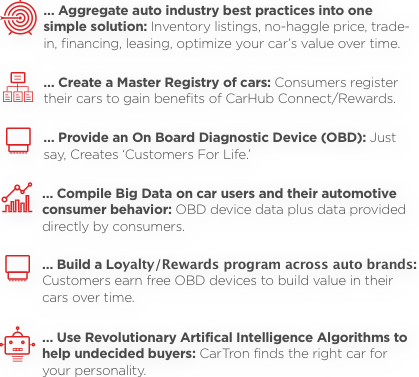 To learn more about CarHub Connect's functions, click here. Not only do we offer CarHub Connect and all its associated services for free to our members, but we are happy to extend this offer to our Certified Carhub Dealers - for as many units as they'd like to distribute to customers or even friends and family. With each car owner who is given the device, the initial default service center of choice, both in the CarHub app and on CarHub.com, is the dealer who provided it. This means that when CarHub Connect notifies owners that their car is in need of maintenance or repairs, the original dealership provider is the first option for all services. 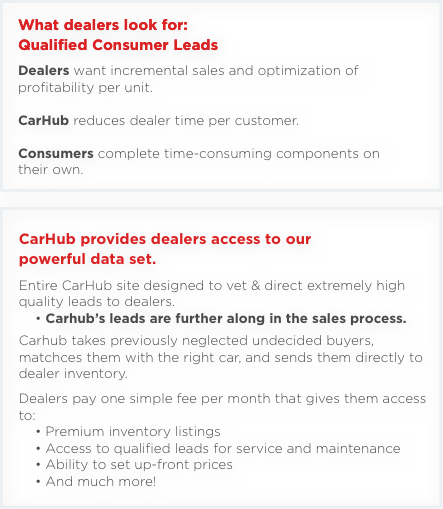 In this way, CarHub Connect creates significantly higher return and loyalty rates for dealership service departments. CarHub also creates exponentially greater user engagement than other sites by using "Sticky Content." This is an important, even vital, part of why CarHub is now the go-to automotive portal. Provides constant user engagement with CarHub beyond the car buying/selling process. All other automotive sites only serve that tiny 2% of consumers who are in-market and may need vehicle pricing services once every 4 or 5 years, on average. This eliminates the large majority of car owners who need automotive services on an ongoing basis. CarHub knows better. 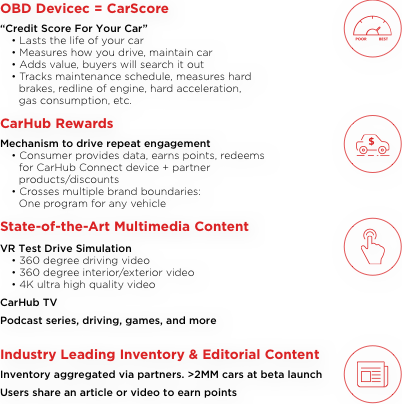 That's why we use CarHub Connect, the only rewards program in the industry, and our cutting edge Multimedia Content to attract users from outside the automotive realm on the Internet. This not only creates a whole new set of potential users, but keeps CarHub members engaged with CarHub.com so that it is the leading destination for whatever car needs they may have at any time during their car ownership experience. CarHub creates a compelling set of product offerings that brings your customers in and keeps them there.